Samsung BioLogics said Wednesday that it has signed a single-use raw material purchase contract with Saint-Gobain, a French-based multinational corporation that focuses on construction and healthcare. Samsung BioLogics CEO Kim Tae-han (left) and Laurent Guillot, Saint-Gobain’s president of high-performance materials hold up their agreement at Samsung BioLogics headquarters in Songdo, Incheon, on Tuesday. Single-use raw materials refer to one-time plastic parts used in biopharmaceutical production and development. 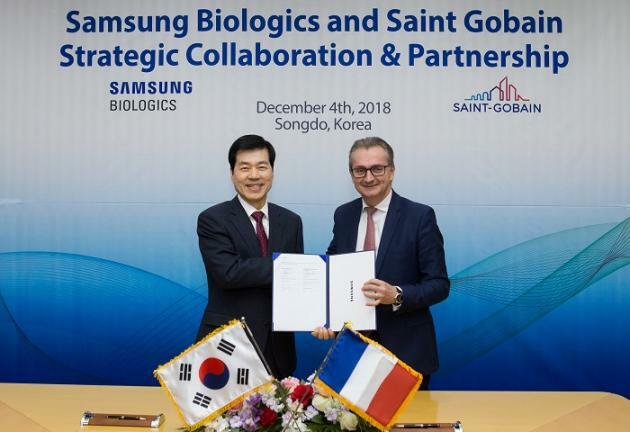 Under the contract, Saint-Gobain will supply up to 160 different types of raw materials, such as tubing, filters and hoses, to Samsung BioLogics. Until now, Samsung BilLogics has produced products that required only small quantities using single-use raw materials. As these raw materials came from overseas factories, it took a long time to import and clear customs for the materials. Through this contract, the company expects it will be possible to obtain single-use raw materials more efficiently and conveniently, shortening the procurement period from four months to one month. The two companies signed a memorandum of understanding with the company in April. In September, the French company signed a land purchase contract to build a 13,000-square-meter high-tech bioprocess product manufacturing facility in Songdo, Incheon, and aims to complete the plant by 2020. Due to the nature of the biopharmaceutical industry, most of the raw materials depend on overseas supply chains which take a long time to import, forcing Samsung BilLogics to hold a large amount of inventory to prepare for emergencies. To solve these problems, Samsung BioLogics is actively supporting the construction of the domestic bio-industry ecosystem by attracting global companies to Songdo as well as fostering local companies to stabilize procurement of raw materials and create quality jobs. As a result of these efforts, GE Healthcare, in cooperation with Samsung BioLogics, established M-Lab and Fast Trak in 2016. Merck is also building a manufacturing plant with an investment of $26 billion this year and expects to complete the construction of the plant by 2019. In July, Samsung BioLogics signed a supply contract with Biocs, a domestic company, to create bio-raw materials and equipment manufacturing companies, while trying to foster local companies by providing global good manufacturing practice (GMP) compliance consulting. The company is pleased to have played an essential role in establishing the bio-cluster ecosystem in Korea through the signing of this supply contract, he added.